Tricia Miles--owner of Haven't Got a Clue, the best mystery bookstore in Stoneham, New Hampshire--once again plays amateur sleuth as she is unexpectedly reunited with a man from a chapter of her life she closed long ago... The town of Stoneham is a haven for bookstores, but it is sadly lacking in bed-and-breakfasts. Fortunately Pippa and Jon Comfort's Sheer Comfort Inn is about to open, and the couple has offered some locals a free night as a trial run. But it won't be so easy to sleep after Tricia makes two startling discoveries: Pippa's murdered body in the backyard, and the fact that Pippa's husband, Jon, is actually Harry Tyler, a man Tricia loved--and believed dead--for nearly twenty years. Though Harry is the prime suspect, Tricia doesn't believe him capable of murder, even though he's led a life of lies. Especially when she discovers that Pippa had a few secrets of her own--some that may have been worth killing for. Includes recipes. 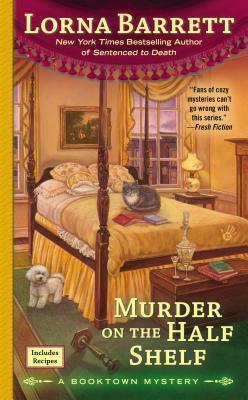 LORNA BARRETT is the New York Times bestselling author of the Booktown Mystery series. She lives in Rochester, New York.